Yesterday was a bad day for me. The company I work for laid off 84 people and cut my pay. I guess I’m one of the lucky ones. Last night it was hard to get motivated. I decided to do a quick sketch to capture the way I felt, comfortably numb. It has been weeks now since I have made an entry here. I think about art all the time, but can’t find the time to do any of it. Having a full time job and being involved with other activities that take up my evenings I have little time left over for my artistic endeavors. Never the less I will forge ahead. Yesterday I went to draw portraits at the Veteran’s home in Mt. Vernon. I try to get there every other week. 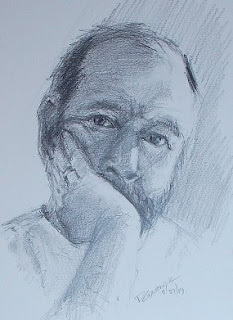 I’ve been at it almost a year now and have done over fifty portraits. These are quick studies where I try to capture their likeness in about 30 minutes. Yesterday I did 4 of them. It was a tough crowd but still worth the trip. I’m convinced that working from life is the best way to learn how to draw and paint. I was motivated yesterday to get back to work. 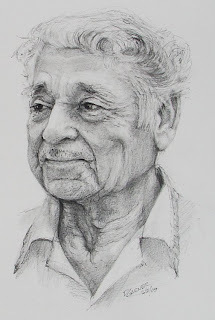 Not having a model to draw, I worked from a photograph that I had taken of this gentleman in Mexico. Another still life, I started last Saturday and painted all but one night through the week. I hoped I would finish it working in the evening. This Saturday I painted all day because now I was painting in natural light. Using a medium of one part Stand Oil and Two parts Linseed Oil I painted over the entire painting making color and value adjustments. What I thought would be a simple still life, turned out to be a challenge. My focus was to capture the green bottle and make it look translucent. The place mat in the background had been folded in a triangle and I liked the starburst pattern the folds made. The grapes well they were a lost cause. 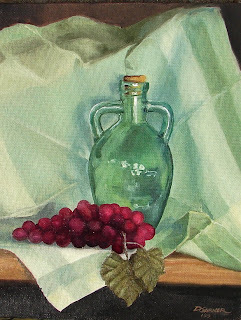 I wanted to add a complimentary color to work with the green, but I wished I had used real grapes.